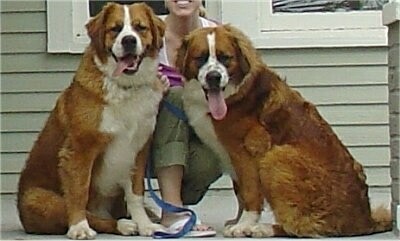 Henry and Soda are Saint Bernese (St. Bernard / Bernese Mountain Dogs) from the same litter shown here full grown. At one year and two months they both weighed in at 100 pounds. These dogs are very gentle, loving and protective. 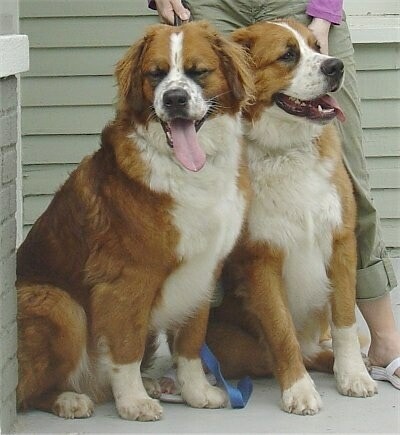 Their father is a 120-pound Saint Bernard and their mother a 60-pound Bernese Mountain Dog. There were 4 puppies in the litter. All four puppies have the same coloring as you see on Henry and Soda; two of the four have more freckles on their nose and darker eyes. Henry and Soda are examples of each. The Saint Bernese is not a purebred dog. It is a cross between the Saint Bernard and the Bernese Mountain Dog. The best way to determine the temperament of a mixed breed is to look up all breeds in the cross and know you can get any combination of any of the characteristics found in either breed. Not all of these designer hybrid dogs being bred are 50% purebred to 50% purebred. It is very common for breeders to breed multi-generation crosses. Henry and Soda, St. Bernard / Bernese Mountain Dog mix breed dogs (Saint Berners) shown here at 6 months old. Henry and Soda, St. Bernard / Bernese Mountain Dog hybrids (Saint Berners) full grown—"My husband and I have traditionally been ‘cat people’ and these are our first dogs. The experience has been amazing and has changed our lives for the better. We can’t imagine living without them."